But doesn’t the sign say “Kawagoe Tansu”? Great find! I had completely ignored that sign… Looks like it was quite large, indeed. 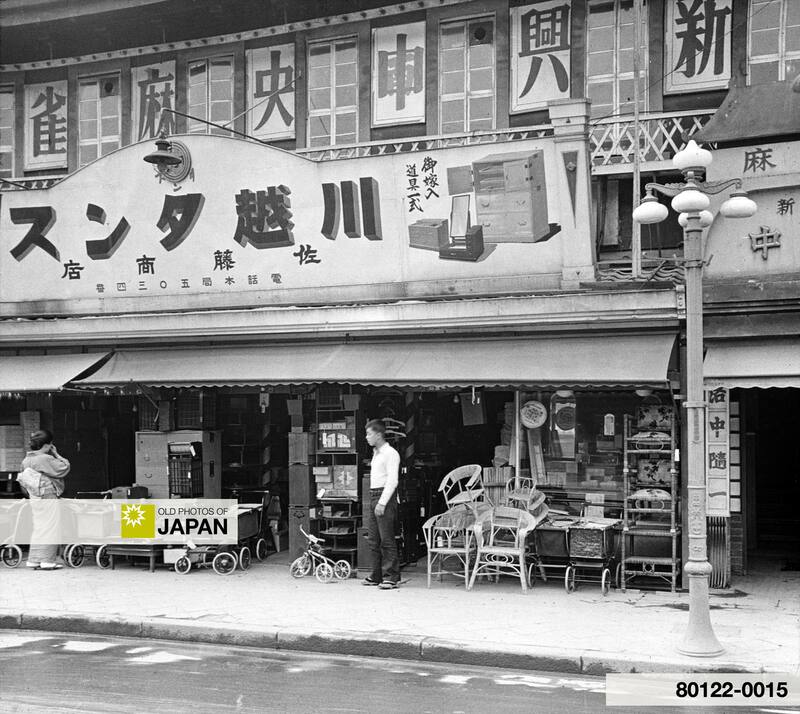 A furniture store in Kyoto in May 1934. Notice the tricycles and prams. Both are articles that you would not expect at a furniture store. The classical street lamp is a wonderful work of art. Another interesting aspect are the many chairs on display. Western influences have clearly already deeply penetrated the Japanese lifestyle in the early 1930s, only some 80 years after Commodore Perry forced Japan to open up to the world in July, 1853. This glass slide is one of a series of slides of Japan that was used by the New York State Education Department to teach students about Japan. The New York State Education Department collected photographs of life in a large number of countries and the collection ran into many thousands. These slides were loaned to schools throughout New York State from 1856 to 1939. They were one of the earliest uses of audio-visual techniques for classroom instruction. You can also licence this image online: 80122-0015 @ MeijiShowa.com. Interesting photo. The large sign above the furniture shop says (in the old right-to-left style) “Shinko Chuo Mahjongg”. Presumably that is a large mahjongg parlor located above the furniture store? Probably is if the 3 characters on the sign at the entrance on the right of the photo are related. @tokyo2la: There are kanji above the “Kawagoe Tansu” sign. The ones in the windows. They advertise the “Shinko Chuo Mahjong” parlor. Hmm, the description lists this as Kyoto… but the sign clearly says Kawagoe, which is in Saitama north of Tokyo? I suppose it could just be a name. @Chris: Good point. I have assumed it is just name. The name of the location was printed on the slide itself, together with the date the photo was taken. Considering the original source (New York State Education Department), I consider it highly reliable.